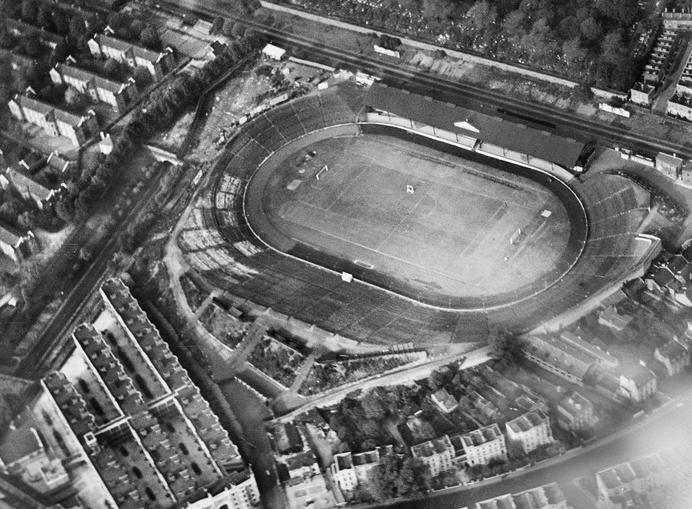 Stamford Bridge officially opened on the 28th of April 1877, but for the next 28 years mainly served as an athletics venue. The owners, however, wanted a stadium that could host professional football, and hired architect Archibald Leitch to design a new stadium. 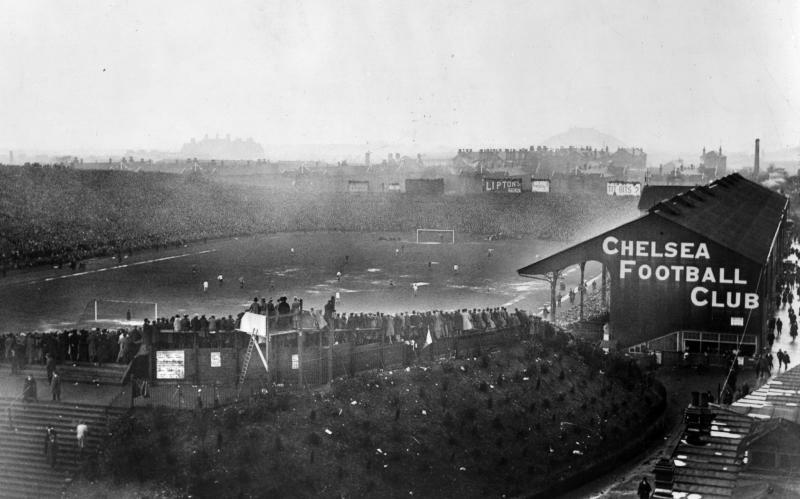 Stamford Bridge got almost completely rebuilt in 1905, and was subsequently offered to Fulham FC. Fulham turned the offer down though, and newly formed Chelsea FC moved in instead. 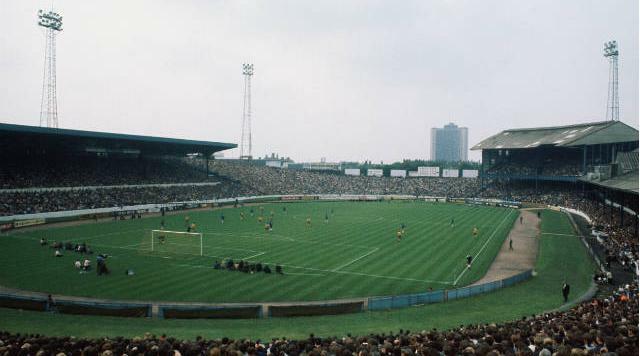 Stamford Bridge at that time consisted of one covered seating stand and a vast open bowl of terraces covering the other three sides. An estimated 100,000 people could fit into the stadium. 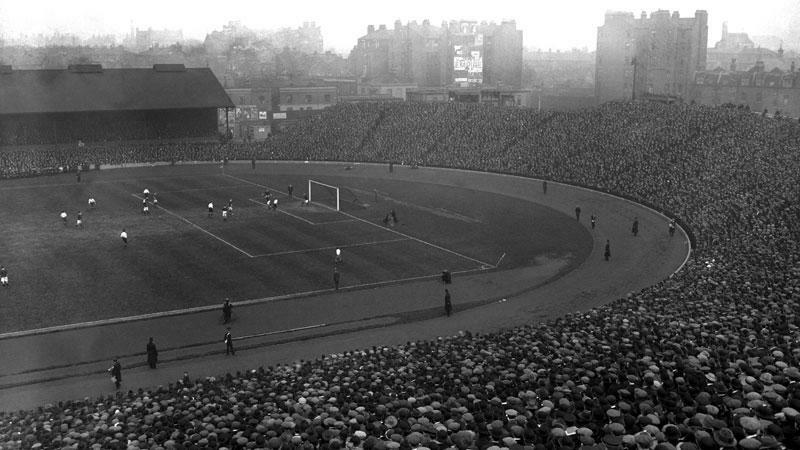 Few changes were made until 1930, when new terraces were built at the Shed End, and, nine years later, when a small seating stand was built at the North End. 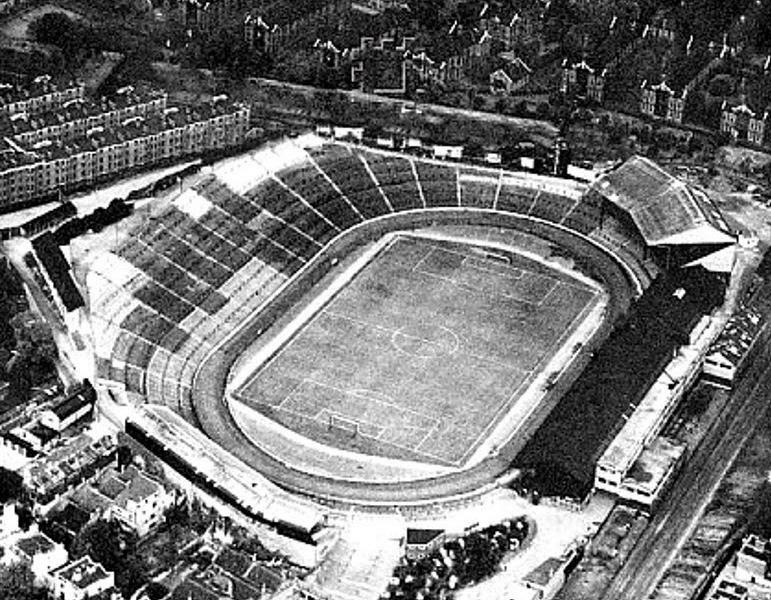 Stamford Bridge recorded its highest attendance in 1935 during a match against Arsenal when a total of 82,905 fans attended the match. In 1965, the terraces of the West Stand were replaced by a new covered seating stand. Redevelopments continued in the mid 1970s when the old main stand was demolished and replaced by the new East Stand. 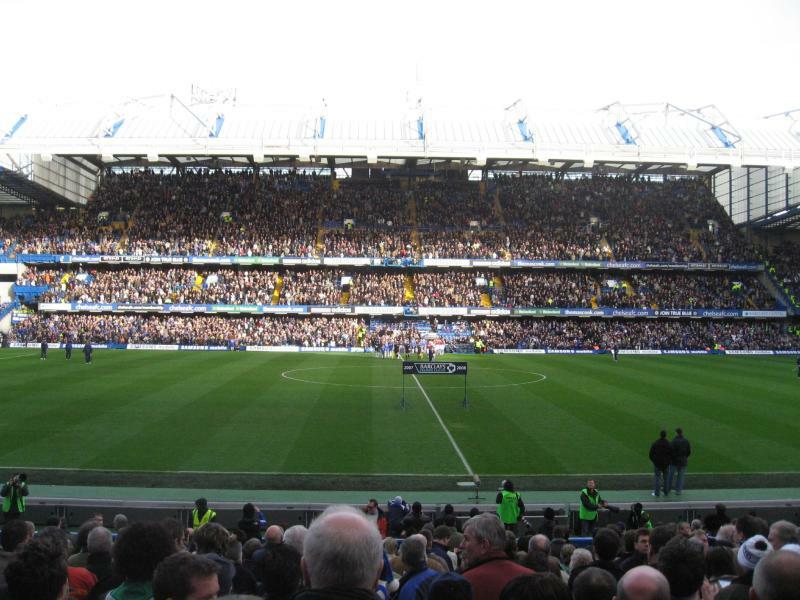 The construction of the new East Stand turned out to have such an effect on Chelsea’s finances though, that the club was almost forced into bankruptcy. 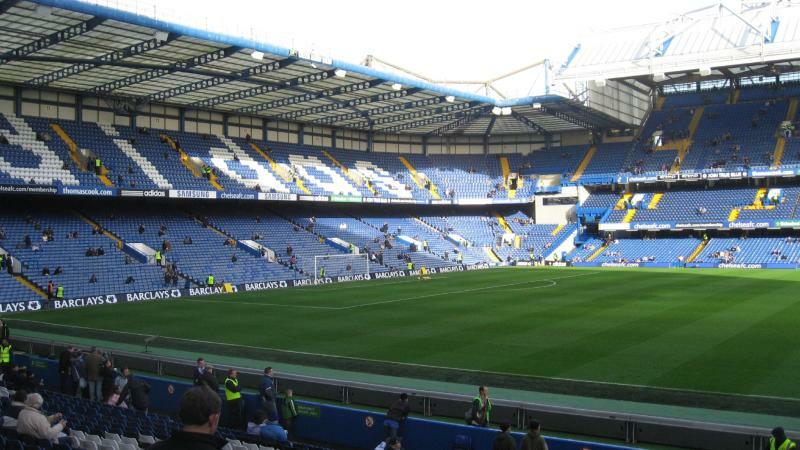 The Stamford Bridge site was sold to property developers in order to pay off some debts, which almost resulted in Chelsea being evicted and forced to ground share with Fulham or QPR. The club finally won back ownership in 1992, however no changes were made in the years in between. 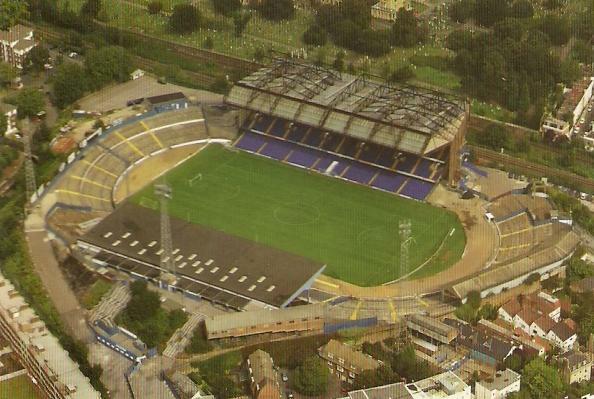 In the meantime, the Taylor report had been published and Stamford Bridge was in urgent need for redevelopment. Works started in 1994 with the demolition of the North terraces, which were replaced with a new seating stand. Soon after, the Shed End terraces suffered the same fate. Reconstruction of the West Stand started in 1997 and was, with some delays, completed in 2001. 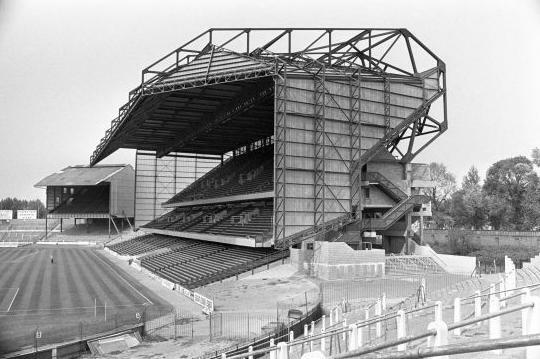 At the same time the East Stand had undergone an extensive refurbishment. 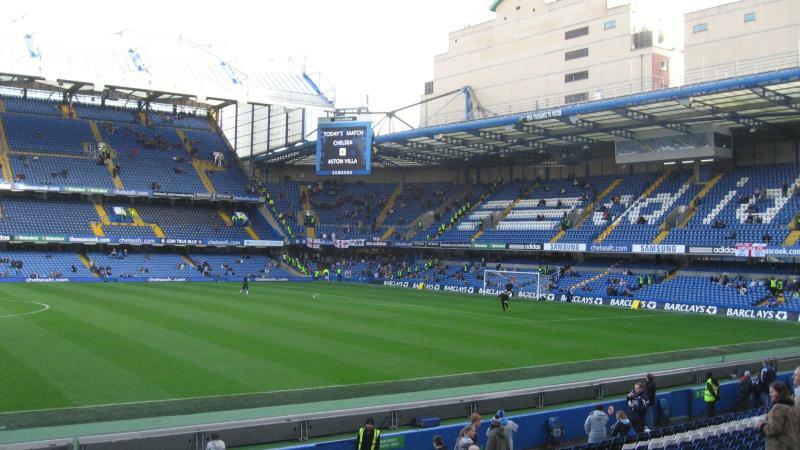 Despite all of this, Stamford Bridge is still a ground with limitations in terms of capacity and facilities, and in the last decade Chelsea have therefore sought to either expand Stamford Bridge or build a new stadium altogether. Expansion of the current ground turned out to be too complicated with the stadium being hemmed in by housing, and initially the club therefore explored different sites in West London for the construction of a new stadium, most notably the site of the Battersea Power Station, though their bid for the site failed in 2012. 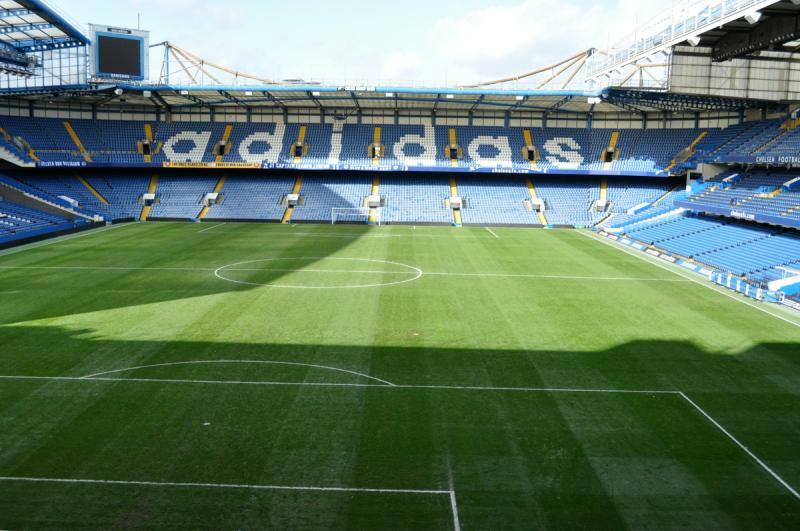 Following their failed Battersea bid, the club directed their attention back to the Stamford Bridge site, and in 2015 announced plans for the construction of a complete new stadium. Later that year, the first images were presented of a 60,000 all-seater designed by Herzog & De Meuron architects. The project, estimated to come at a cost of over £500 million, got approved by the local city council and major of London in early 2017. The club currently hope to move into their new home before the start of the 2021-22 season. During the works, they would have to play their home matches elsewhere. Both Wembley Stadium and Twickenham have been named as possible options. 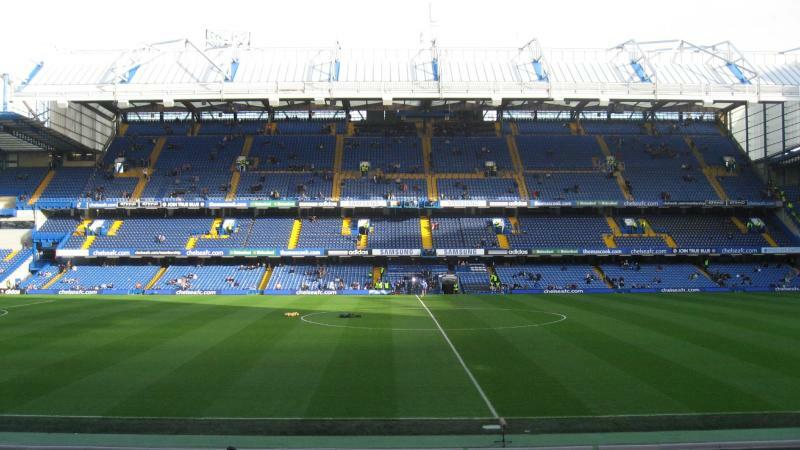 Stamford Bridge is located rather centrally in London in the borough of Hammersmith and Fulham. The stadium lies slightly less than 2 miles south-west of Hyde Park and the Harrods Store, and less than 3 miles south-west of Buckingham Palace. The nearest tube station is Fulham Broadway, which is on the District Line. One can get to Fulham Broadway by taking a Wimbledon-bound train from Earl’s Court station, which is on the Circle and Piccadilly Line. Earl’s Court station itself is also within walking distance of the stadium (20 minutes). Alternatively, one can reach Stamford Bridge by London overground. Both West Brompton and Imperial Wharf stations are a 15-minute walk away from the stadium. Various buses pass the stadium on Fulham Road, which include line 14 (from Euston Square to Putney), line 211 (from Waterloo Station to Hammersmith), and line 414 (from Maida Vale to Putney Bridge). Other lines that pass in the vicinity of the stadium are bus 11 (from Liverpool Street Station), 28 (Kensal Rise), 296 (Ladbroke Grove and Clapham Junction), and 391 (Richmond). 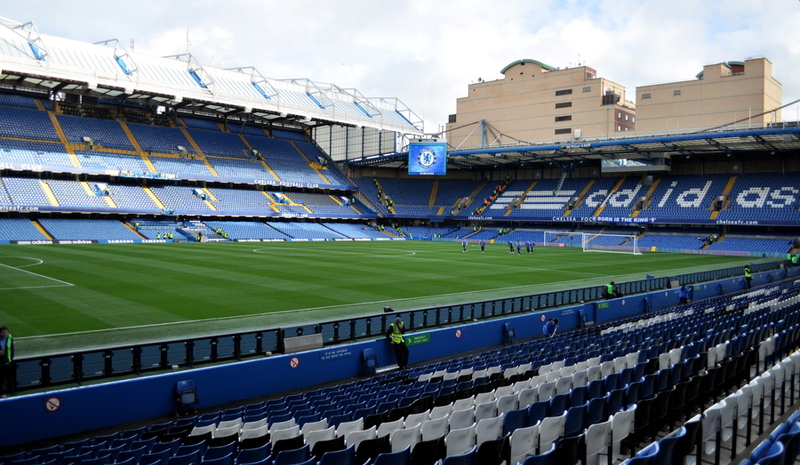 Chelsea does not recommend arriving by car on matchdays as no parking is available. On non-matchdays limited paid parking is available underneath the stadium. If arriving by car from the M25, take the M4 (which turns into the A4) into the city. At Earl’s Court turn right onto Earl’s Court Road, and after about a mile right onto Fulham Road. After a few hundred metres the stadium will be on your right. 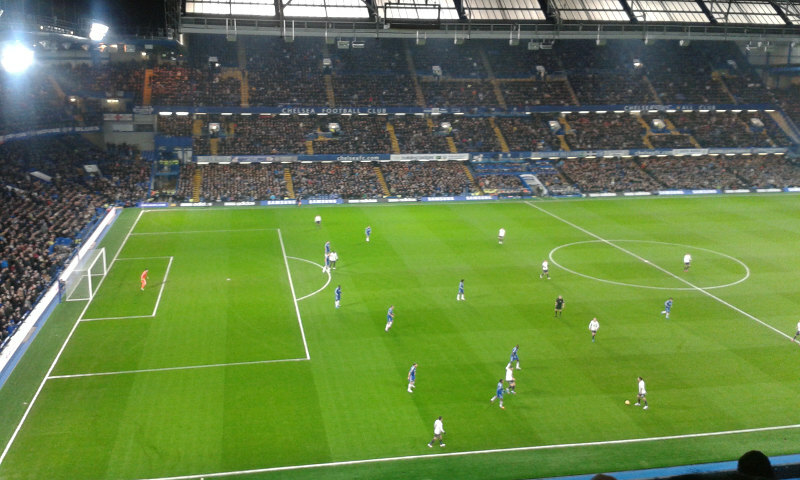 Stamford Bridge is located on the border of the well-off Chelsea and Fulham areas. While somewhat quieter than the Chelsea area north-east of the stadium, there are some coffee shops, restaurants, and pubs near the stadium, mainly on Fulham Road and King’s Road a little further south. Right next to the stadium is the Chelsea Village complex, which houses a few restaurants, a sports bar, and the Millennium Hotel, which, as you may expect, is of the more luxurious type. 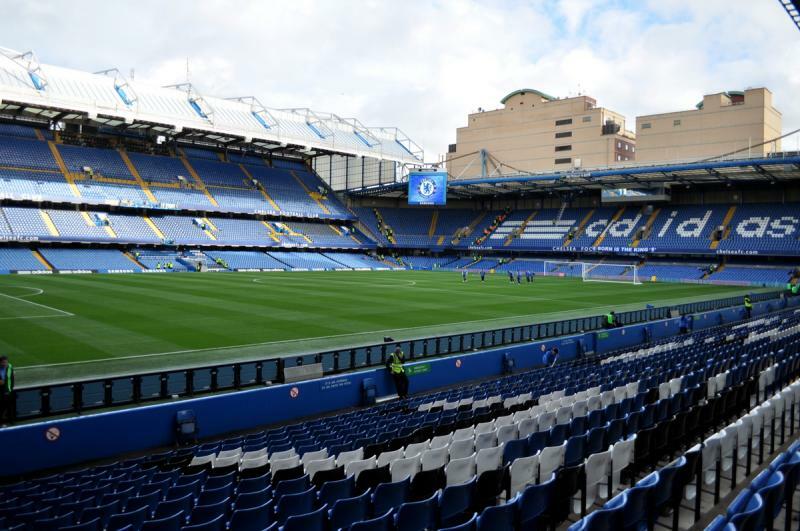 There are a few more hotels at short walking distance from Stamford Bridge, and lots of them a little further away near Earl’s Court tube station. Hotel Ibis Earls Court and a Holiday Inn Express lie just north of the stadium, whereas the exclusive Wyndham Grand London sits on the banks of the river Thames. Decent hotels near Earl’s Court station, a short 15-minute walk from the stadium, include the London Town Hotel, Rushmore Hotel, Henley House Hotel, and Lord Kensington Hotel. Click here for all hotels near Stamford Bridge. Further hotels in Central London can be found here. Tickets for Chelsea FC games can be purchased online, by phone +44 (0) 871 984 1905, or at the box office at Stamford Bridge. 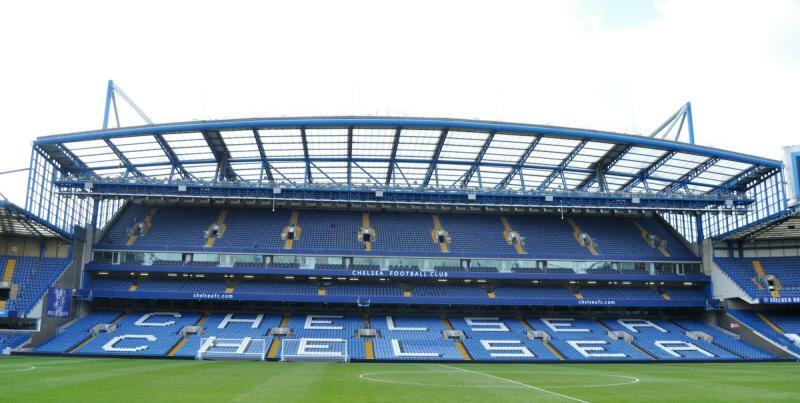 Chelsea club members get priority to buy match tickets. All regular league matches sell out and it is therefore advised to buy as much in advance as possible so make sure to check the Chelsea website for on-sale dates. You’ll likely won’t succeed to get tickets without a membership. Chelsea matches fall into three pricing categories. Tickets for category B games, the cheapest, range in price from £47.00 for a lower-tier seat at one of the ends to £65.00 for a seat at the upper West Stand. Tickets for category AA+ matches cost between £56.00 and £82.00. Some restricted view tickets can be a little cheaper. You can find a seating plan here. For more information call 0 871 984 1905 (UK) or +44 207 835 6000 (international). Chelsea FC offer guided behind-the-scenes stadium tours, which include access to the home dressing room, the players’ tunnel, press room, and the Chelsea museum. The tours last about 60 minutes. Tours run seven days a week every half hour between 10:00 am and 3:00 pm. The museum is opened from 9:30 am to 5:00 pm (last entry at 4:00 pm). There are no tours on matchdays or the day before a European home fixture. The museum is opened on regular matchdays, but not on European matchdays (or the day before). Bookings can be made online. Walk-ups are allowed, however subject to availability. The tour costs £19.00, museum access only £11.00. A discount of £3.00 is offered if booked in advance online. Email tours@chelseafc.com for more information. Chelseafc.com – Official website of Chelsea FC. 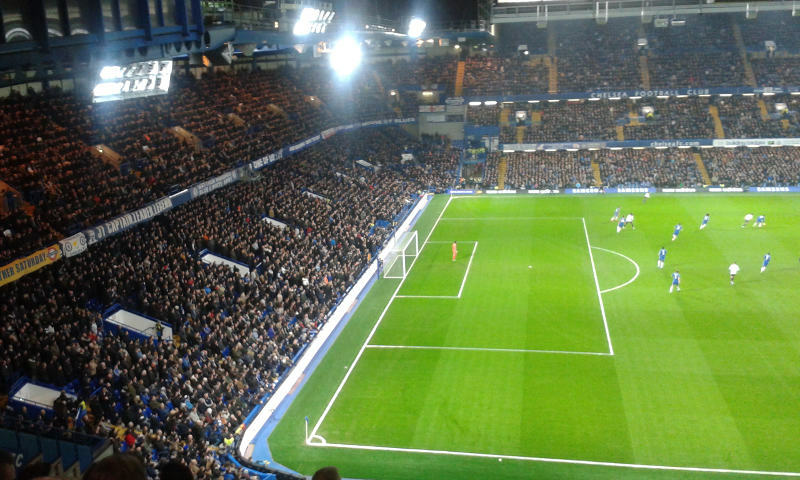 I’ve only been to Stamford Bridge once, and it was amazing. I was on holiday from Canada and have been a life long Chelsea fan. The tour was awesome, we did the private tour, which I would recommend to anyone who is from far away and making the special visit. On game day, the atmosphere was amazing. When Chelsea scored, the whole place just roared. It was quite the experience. I’m hoping to visit England again soon, and hopefully catch another game here! 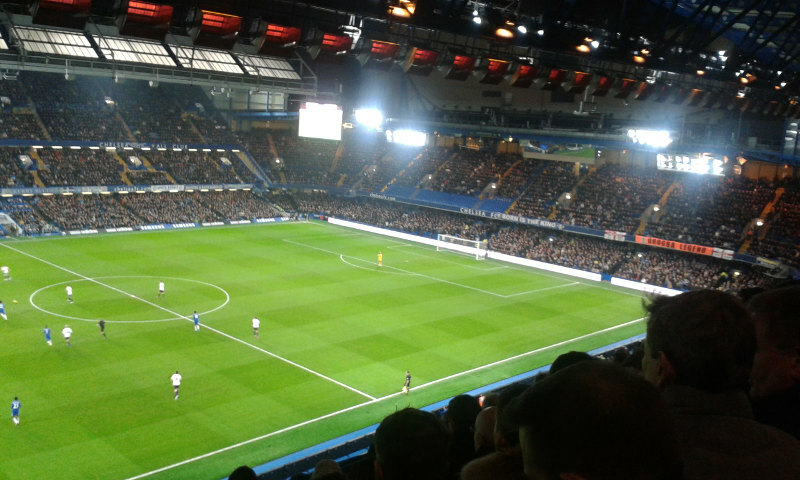 Stamford Bridge is a great ground with good views from most areas. As a member who attends every home game I can attest to the West Stand being occupied by members and season ticket holders for the most part. The heated Upper West is best for winter games but Lower West provides the best close-up and personal experience. 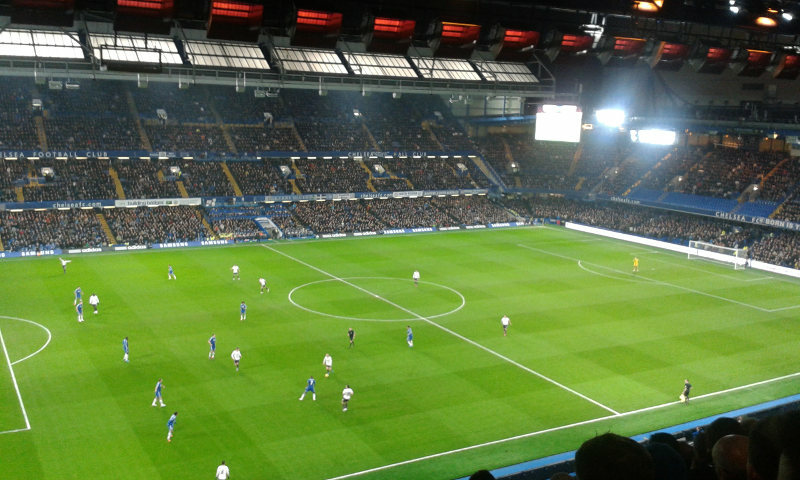 Stamford Bridge is a great stadium to visit! I am a Chelsea member myself which means I get priority access to match tickets which is fantastic! I go to a few matches during the season! The Bridge does lack atmosphere but I must admit that the best stands for the singing is The Shed and the Matthew Harding! The East and West stands are usually full of tourists and families. The stadium tour is great as well as you get to go in the press room, the home and away changing rooms, the tunnel, the dugouts and you even get to sit in The Shed upper tier section during the tour! 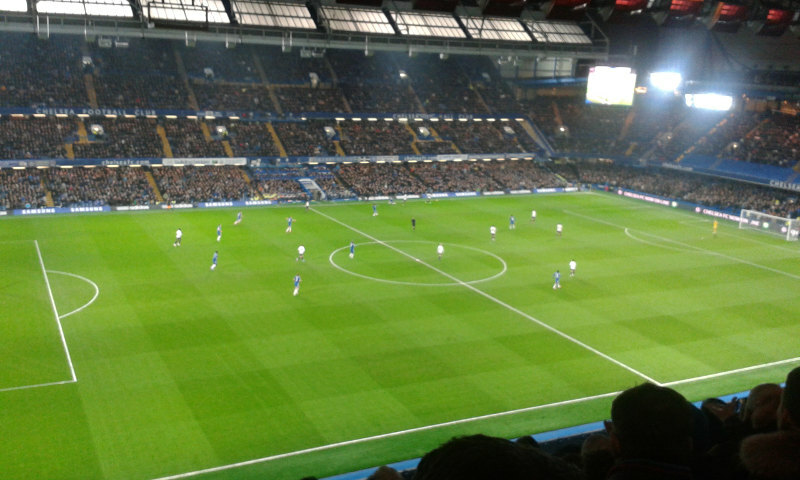 I highly recommend any football fan to visit Stamford Bridge!